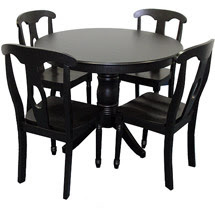 I have searched high and low for a black round dining table. RC Willey is out of stock, www.directsourcefurniture.com is somewhat expensive, but good ol' reliable Wal-mart has the perfect table for me! Only it seats six. I think that's my dream table. LOL It was so nice to be up and away from tugging little hands.